How effective is the use of Sporting Celebrities in Advertising and Marketing? How effective is the use of Sporting Celebrities in Advertising and Marketing? 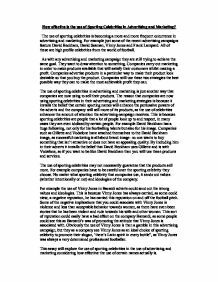 The use of sporting celebrities is becoming a more and more frequent occurrence in advertising and marketing. For example just some of the recent advertising campaigns feature David Beckham, David Seaman, Vinny Jones and Frank Lampard. All of these are high profile celebrities from the world of football. As with any advertising and marketing campaign they are still trying to achieve the same goal. They want to draw attention to something. Companies carry out marketing in order to make products available that will satisfy their customers whilst making a profit. Companies advertise products in a particular way to make their product look desirable so that you buy the product. ...read more. Companies such as Gillette and Vodafone have attached themselves to the David Beckham image, as successful marketing is all about brand image- no one wants to buy something that isn't attractive or does not have an appealing quality. By including him in their adverts it installs the belief that David Beckham uses Gillette and is with Vodafone, so if you want to be like David Beckham then you will use these products and services. The use of sporting celebrities may not necessarily guarantee that the products sell more. For example companies have to be careful over the sporting celebrity they choose. No matter what sporting celebrity that companies use, it sends out values (whether intentionally or not) and ideologies of the company. For example the use of Vinny Jones in Bacardi adverts could send out the wrong values and ideologies. ...read more. 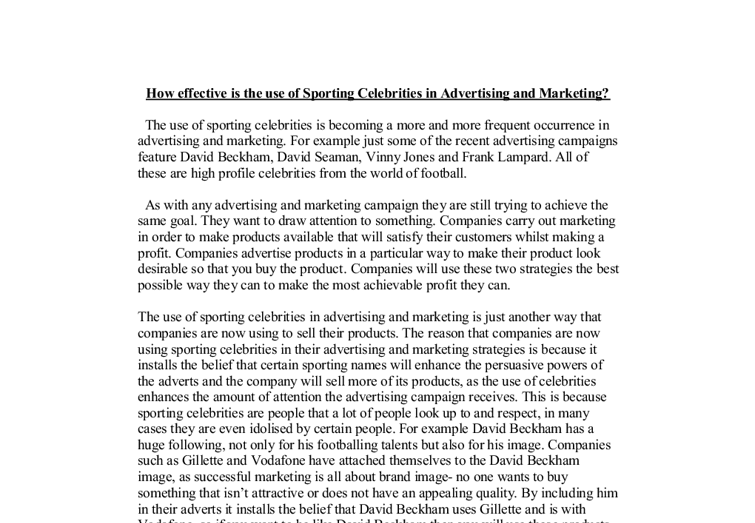 This essay will explore the use of sporting celebrities in the use of advertising and marketing considering how effective the use of certain names actually is. A recent advertising campaign that features sporting celebrity is the Gillette advert. In this advert we can quite clearly see David Beckham after he has just used Gillette. The advert plays on the image that David Beckham carries, and in the advert he comes across, as many people would consider desirable, something which a lot of males would like achieve. So this is an effective way in which a company such as Gillette can use sporting celebrities. It is also a good choice as Gillette is associated with its famous slogan "the best a man can get". This also gives across the ideology that if someone like David Beckham (who can afford anything) uses Gillette then you should. ...read more. Product Promotion and Trial Generation Running a campaign for the web savvy young generation has picked up as a trend across brands in different product categories and fairly successfully at that. Example: Acuvue Contact Lenses Company Profile: J&J Vision Care, a division of Johnson & Johnson, is the world's leading marketer of Disposable Contact Lenses under the Acuvue brand. of varying sizes, shapes and colors that mark eating places, bowling alleys, motels, movies and the like. Outdoor as a Marketing Tool Outdoor is usually a supplemental element in an integrated advertising campaign involving a number of other media. However, it provides several unique features that can reinforce the strengths of other advertising, promotional, and marketing efforts. in which the ABC1 group is the most popular as apposed to the C2DE. Again, this is shown below and highlights the position of the newspaper product within the market in relation to its current situation. It is very important to understand that social class helps structure the market and influences many of the decisions faced by market leaders today. The completed questionnaire will also let me know which goods are in most demand so that I can stock up on wanted goods. If I don't know what the customers demand then I will be taking risks, as I cannot pay to buy every sort of sports goods. and this is the purpose of SARS protective advertisers and Lifeline Security. Therefore, puffery is ethical. Therefore, purposes of five advertisings are earning more profits for the companies; even these advertisings are puffed and exaggerated. As a result, the social responsibility of business is to maximising its profits; therefore, based on the above analysis, puffery is ethical.